The year is 1969, the group is Deep Purple, and the odd-man out in the suit and tie is Malcolm Arnold. Here is the extraordinary story behind this photo as told by Paul Jackson in his biography of Sir Malcolm. A few months after the Prom success of his Concerto for Two Pianos (Three Hands), Malcolm Arnold returned to the Royal Albert Hall to conduct a concert that would for many critics show that Arnold as a serious musician was now beyond the pale and without hope. 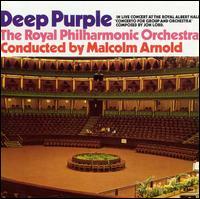 The concert in question took place on 24 September 1969 and saw Arnold conducting the Royal Philharmonic Orchestra alongside the rock group Deep Purple. The concert itself consisted of a performance of Arnold's 6th Symphony, a solo set by the band and finally the premiere of the Concerto for Group and Orchestra by Jon Lord, the keyboard player with the band. In the 1980s, orchestras willingly collabarated with pop musicians and recorded works by Queen or the Beatles, or David Bedford's symphonic treatment of Tubular Bells, but in 1969 - with the exception of the Beatles - pop musicians and classical musicians simply did not meet. There was trouble at the first run-through when the (mainly) long-haired group arrived on stage to a chorus of wolf-whistles from the orchestra. Soon into the rehearsal it looked as though the project would be a disaster, the major problem being the balance (or lack of it) between orchestra and heavily amplified band. The first run-through ended badly, mainly due to the performance - or lack of it - of the orchestra, many of whom were not taking the project seriously (though they were happy to take the band's money). 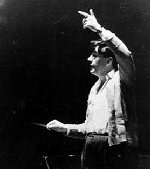 Arnold stepped in at this point, rapped his baton on the music stand and spoke to the orchestra as only one of their own could, saying 'I don't know what you think you are doing! You're supposed to be the finest orchestra in Britain, and you're playing like a bunch of c***s. Quite frankly, with the way it's going, you're not fit to be on the stage with these guys, so pick yourself up and let's hear some b******s ... We're going to make history tonight, so we might as well make music while we're doing it!' This shock tactic worked, the rehearsal went more smoothly and the Gala Charity Concert went ahead. The performance was filmed and shown in an edition of BBC2's arts programme Omnibus under the title 'Best of Both Worlds.' This showed Arnold and Lord in conversation, together with rehearsal footage and the final performance of the concerto, though in a slightly edited version. Arnold in full evening dress is in complete command of the forces and galvanises the orchestra and band into some thrilling playing. The beat with the right hand may seem a little wayward but it is quite clear, with the left hand clearly indicating entries. It is striking how Arnold's face (right) is never buried in the score but maintains constant and immediate eye-contact with his performers. His energy and commitment are apparent, as is his humility in sinking into the shadows to allow band and orchestra to bask in the applause. Sir Malcolm Arnold would have been 85 this Saturday, October 21 2006. Happy birthday Sir Malcolm, I'm sure you are hard at work proving that the devil doesn't have the best tunes. Read On An Overgrown Path's tribute here. * The Concerto for Group and Orchestra composed by Jon Lord and performed by Deep Purple and The Royal Philharmonic Orchestra conducted by Malcolm Arnold was recorded live at the concert. It was originally released as a Harvest LP, and a video recording of the complete concert was released on DVD in 2003 including the performance of Arnold's 6th Symphony. That's a great story. Thanks.